Teesside Hackspace has moved into its new space at 3D Brighouse, Tuesday night open nights are back on. For chat and involvement in projects, check Slack. We’ve founded Teesside Hackspace Ltd to provide a hackspace for people in Middlesbrough and the surrounding area. 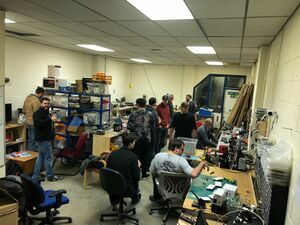 A hackspace (a.k.a hackerspace, makerspace, hacklab) is a community run workshop where people can come to build things and collaborate on projects with like-minded people. Our new space is at 3D Brighouse Middlesbrough (near Teesaurus park). We’re a not-for-profit community run organisation, so our monthly income will be used to cover the costs of running the space, and pay for new equipment. If you’re interested in using Teesside Hackspace, we encourage you to become a member and pay what you feel the space is worth to you.